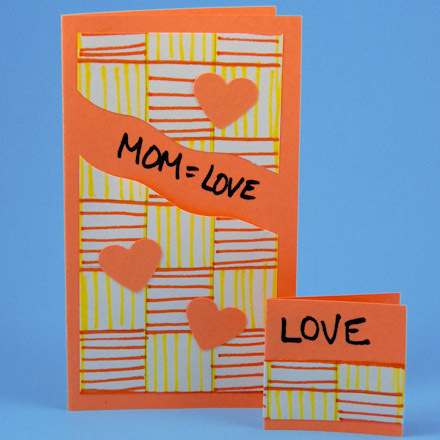 This craft project is a kid version of the grown-up Pocket Greeting Cards Tutorial. 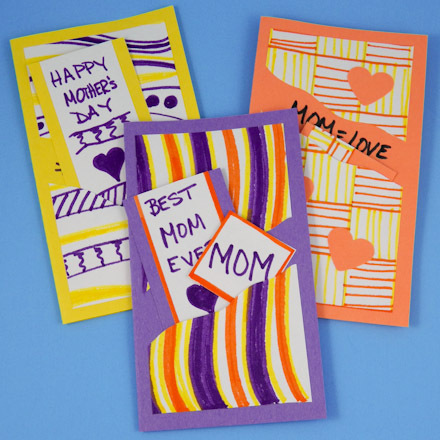 These fun and unique cards for Mother's Day feature a pocket on the front that the kids can fill with little gifts for Mom. Anything small and somewhat flat can be placed in the pocket—maybe a bookmark, a gift card, or a tiny picture. Colored construction paper and white paper decorated with crayons, colored pencils or markers are the basis for these cards. 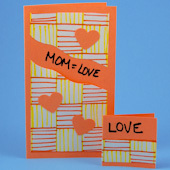 Every card is unique and showcases the creative talent of the child making it! Of course, the card can be made for any occasion by changing the message. 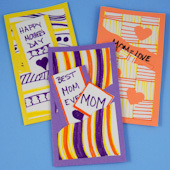 Related craft: See the Kids' Four Patch Birthday Cards craft project for another card featuring kid-made fancy paper. 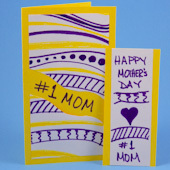 Also, checkout the projects listed in Greeting Cards Kids Can Make. Colored construction paper, 9" by 12"
White construction paper or drawing paper, 9" by 12"
Pre-cut the paper. Cut the 9" by 12" colored construction paper in half to make two 9" by 6" halves. Cut the 9" by 12" white construction paper or drawing paper in quarters that are 4½" by 6". Each card requires one of the 9" by 6" colored construction papers and two of the 4½" by 6" white papers. Tip: Be sure you have markers, crayons or colored pencils that coordinate with the colored construction paper. Keep it simple by using just two or three colors of markers, including one that is the same color as the paper. Trim 2" off the length of the 9" by 6" colored construction paper. Set the 2" strip aside for later. Fold the remaining 7" by 6" piece of colored construction paper in half. This is your card blank. Set it aside for now. Tip: This card fits a standard #6¾ envelope, sometimes called personal size, which is 3 5/8" by 6 1/2" in size. Decorate one of the 4½" by 6" white papers with crayons, colored pencils or markers. 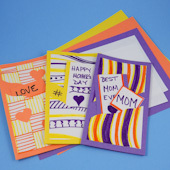 One idea is to fill the paper with zigzag or wavy stripes in three colors that go together with the card's color. First, use your pencil to draw lines across the paper, spaced ½" or so apart, then color the stripes with alternating colors. Of course, you can color your fancy paper creation any way you like. It's best if you use just two or three colors that look good together and keep your shapes large and simple. Cut a 1½" strip off the side of the fancy paper and another 1½" strip off the top. Do the same for your other 4½" by 6" piece of white paper. Set the strips aside to make things to put in your card's pocket or for use inside the card. Cut the remaining 3" by 4½" piece of fancy paper into two pieces on a wavy diagonal line that starts about 1/3 from the bottom. Glue the top part of the fancy paper to the top of the card with equal borders on the left, right and top. 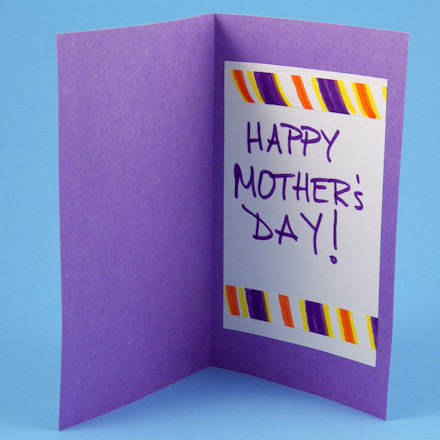 Glue the bottom part of the fancy paper to the bottom of the card as a pocket. To do this, apply a narrow band of glue to the left, right and bottom. Place the pocket at the bottom of the card with even borders. Be sure to leave the top of the pocket open. 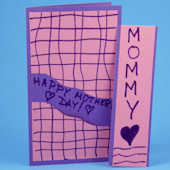 In the diagonal space above the pocket, write a Mother's Day greeting. Something simple, like "I love you! ", is best. At this point, you will have five pieces of leftover paper—a strip cut from the colored construction paper, two strips from the fancy paper and two strips from the white paper. 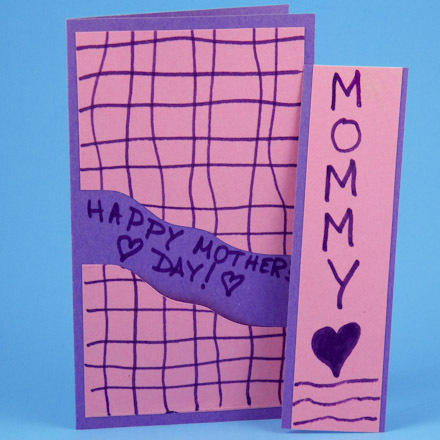 Use these strips of paper to make things to put inside your card's pocket. You might make a bookmark from the colored construction paper by gluing a strip of fancy paper to one side and a strip of white paper to the other side. Write a message or draw some pictures on the white strip. It is best to make the bookmark no longer than 5". 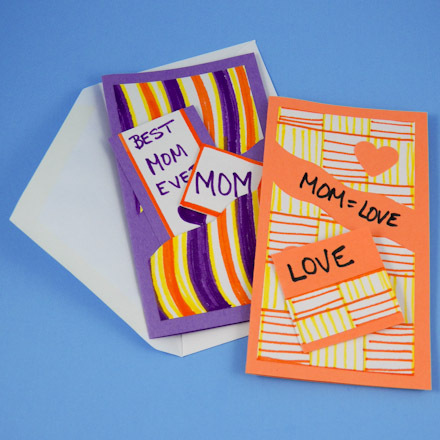 You could also fold a strip in half to make a mini-card with a secret message to your mom. Another idea is to glue a mini-picture of yourself to a piece of the leftover paper. What are your ideas? When you are done making stuff for the pocket, slip the items into the card's pocket. Write a message on the 3" by 4½" piece of white paper or draw a picture, if you like. Try something like, "Happy Mother's Day!" or "I'm so glad you are my mother!" Just say something that will make your mom smile. Glue the paper with your message inside the card. Add any other decorations that you like. That's it! 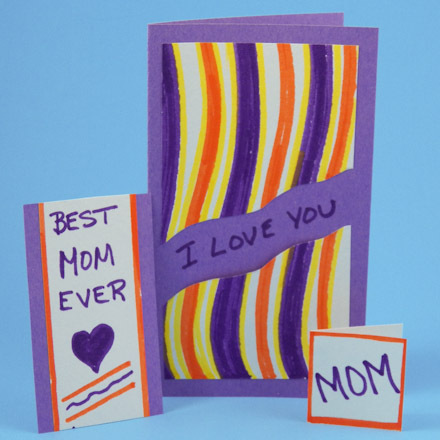 Your Mother's Day card is done! Tip: Make a bookmark and a mini-card with the leftover paper strips. They will fit in the card's pocket—just be sure the bookmark is no more than 5" long. Tip: The pocket card fits inside a standard #6¾ envelope, which is 3 5/8" by 6 1/2" in size. 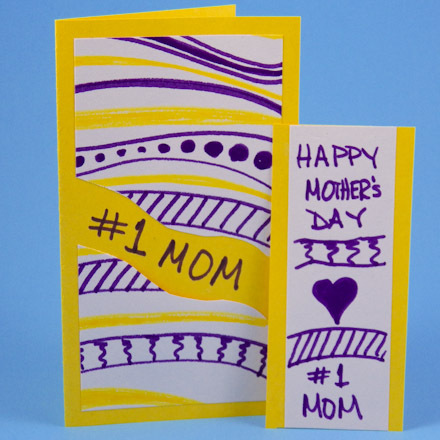 Tip: Use strips cut off the fancy paper to decorate the inside of the card. Tip: Decorate the card with paper punches. Tip: Light colored construction paper may be used as an alternative to the white paper.